Orders require a 1-2 business day processing time before orders are shipped out. Orders made before 1:00 pm PST with Next Day Air will be shipped out same day. Business days are Monday-Friday 8:30am-5:30pm PST, excluding weekends and holidays. ***Note: We currently do not ship to military bases and/or addresses. UPS 2nd Day Air and UPS Next Air Day Air shipping options are available. The USPS shipping rate to a PO Box will be $11.94 for regular ground shipping. *** Free shipping applies to UPS ground shipping option only. Due to this, shipping to a PO Box does not qualify for free shipping, even if the order is over $60. After an order is made, you will receive an Order Confirmation email. After your order has been processed for shipment, you will receive a shipping notification email with a tracking number. If you have not received your tracking number 2-3 days after you have made your purchase (excluding weekends and holidays), please email care@shopatimage.com and we will provide you one right away. You must purchase a total of $60.00 worth of merchandise before taxes, shipping and handling. The $60.00 amount excludes Shopatimage.com gift cards. Offer is non-transferable without consent by Shopatimage.com. Not valid at Image stores. This offer cannot be combined with any other offers. Valid on standard U.S. ground shipping to U.S. delivery addresses in continental states only. 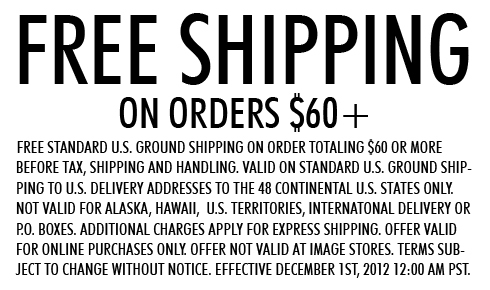 Not valid for international delivery addresses or Alaska, Hawaii, U.S. territories or PO Boxes. Additional charges apply for express shipping. Terms subject to change without notice.